Triskelion staff visited primary-, secondary- and vocational schools in Esenler suburb in Istanbul to see how they have worked towards integrating Syrian refugees into schools and everyday life. We were also granted a welcome at the mayor’s office where he was interested in starting cooperation in the education sector for his team of schools. 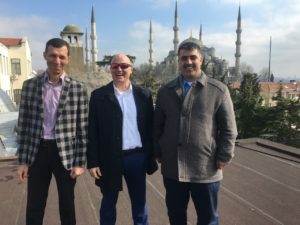 We emphasised our historical connections back to viking times around 900 when a norseman/viking called Halvdan wrote his name on the balcony of the second floor in Hagia Sofia church probably serving as a guard to the royalty.